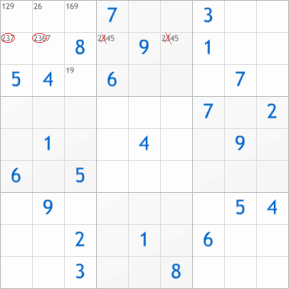 These are the tips and techniques you can use to solve sudoku puzzles. Some of them are quite easy, others are tougher to get. They will, however, allow you to solve every sudoku, even the hardest ones. Read and study each tip carefully to master it and use it wisely during your play. We will explain each technique by writing the base principle, explaining it, then giving a concrete example. Principle: When a number can be set in only one place of a row, column, or box, then this place must contain this number. This technique is a straight consequence of the sudoku rules: each row, each column, and each box must only contain one and only one set of each number. Looking at number 5 within the second box, one can see that it cannot be set in columns #4 and 5 because of other numbers 5 already set in the grid. Therefore, within this second box, the only place available for the number 5 is in column 6. The first step often looks more familiar. Actually you may already use it intensively. It consists in looking carefully at each row, column or box, searching for digits that can only be set on one single place. The second step, however, is less used because one must look at each place, and search for a place that can only accept one number. A classic sudoku puzzle starts with 50-like places to look at! And you must make the effort for every new number! That is where some little marks can help, to indicate which numbers are allowed in an empty place. These little marks are also the basis for every other advanced solving tip. When these simple principles are not enough, there are some other logical rules that help solving sudokus. This logical reflexion is what makes sudoku fun. These logical rules and tips come straight from careful observations and deductions. If you get stuck while trying to solve a puzzle, the task of filling every place with some little marks can be daunting, but it does not take that much time. Principle: When a number can only be placed in one row or one column in a box, then it can not be set in the rest of the row or the column. and its symmetrical: When a number can only be placed in one box in a row or a column, then it can not be set in the rest of the box. In this example the number 3 in the first box can only be placed in row #2. Therefore, even if we do not know where in the row, its position is within box #1. Logically, the number 3 can not be set in the rest of the row. It can be safely removed from little marks of the row. As you can see, this principle does not give direct solutions. But it helps removing candidates, and soon you will be finding places with only one candidate.